Wakonyu Orphans Support is a community based organization, which is dedicated to helping families that have generously adopted children who are orphaned as a result of HIV and AIDS. These children are often adopted by their relatives, especially by their grandparents. These needy families are normally identified through our community representatives within the slums and peri-urban areas of Kisumu City. After which the verification is done by our executive board members to ensure that the family to be supported is a real needy case and meets the minimum requirements. For a beneficiary to join Wakonyu project, they should be taking care of a total orphan, meaning that the adopted child no longer has biological parents. A beneficiary can register up to five children under their NHIF insurance card. Once a child is eighteen, they will be removed from the registry, unless the child is still in school. Most beneficiaries are grandmothers that have adopted their grandchildren. This is why Wakonyu Orphans Support is also called OMA-project. ’Oma’ is Dutch for grandmother. 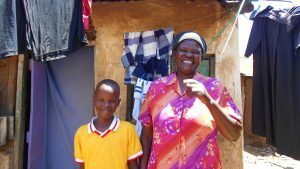 Wakonyu provides these families with hospital insurance that covers all the family members, including the adopted orphans. The health insurance cost per family per month is 500 kenyan shilling, just under 5 euros. This comes down to 6000 kenyan shillings, 55 euros, per family per year. Whenever a registered family is in need of medical care, they come to the Wakonyu office. Our office assistant then writes for them a chit. This chit will indicate for them which hospital to go to and which type of service they need, whether it is In- or Outpatient. They will also receive a copy of their NHIF card, which is normally kept for them in the office. Carrying these two things, a registered patient will then be able to receive care in the hospital. In case anything goes wrong, the beneficiaries are always able to contact Wakonyu office. Besides guiding families through the medical process. We do home follow-ups for our beneficiaries, especially during the time they are admitted in hospital and also after they have been discharged. We also provide free psychosocial support to our beneficiaries when they visit our office. The special thing about Wakonyu is the fact that Wakonyu is the only non-profit organization that is legally allowed to register non-biological children for an health insurance. Restoration of life and hope to aged adopting guardians and adopted HIV/AIDS orphans. 1. Work closely with our beneficiaries in promoting medical health insurance scheme to orphans/ adopting families towards mitigation on the impact of HIV/ AIDS orphans. 2. Working towards reduction of medical health burdens to the aged adopting guardians and HIV/AIDS adopted orphans. 3. Responding to medical health insurance challenges and policies to the vulnerable through awareness, linkages and networking with other organizations. 4. To intensify mobilization for support of HIV/ AIDS orphans and aged adopting guardians/ grandparents. 5. To enhance health insurance information to community as a way of improving their living standards. 6. To contribute to reduction of vulnerability, support/ improve the living standards of the adopting guardians and adopted orphans within the community by restoring their hopes in life.